© 2014 Ted Saker, Jr. All rights reserved. I wrote on one of my older Texas Star Party pages that I am running out of adjectives to describe a successful Texas Star Party. Last year's event was a tough act to follow. The 2014 Texas Star Party did the nearly impossible feat of surpassing the 2013 event. Held May 25 through June 1, this year's star party equaled last year's in the number of clear nights, but six straight clear nights this year left attendees pretty exhausted by the time Saturday rolled around. My sister Anne couldn't repeat her attendance this year, but my friend Joe Golias of Astrozap made his second Texas Star Party appearance with a new imaging rig in addition to one he brought last year. My AT8RCF astrograph made its first Texas Star Party appearance on the heels of its triumphant performance at the 2014 Winter Star Party. I had intended to bring my recently built Scarlet and Gray Astrograph (SAGA) Imaging scope and enter it into the amateur telescope making competition, but a last minute transportation issue forced me to downsize the amount of equipment taken to the Texas Star Party. Thus, the SAGA remained at home. Bringing a proven imaging rig allowed me to avoid the equipment problems that bedeviled me last year. I was able to image on every available night. This year's run concentrated on nebulae using narrowband (H-a, S-II and O-III) filters, and I captured all the necessary sub-frames on two beautiful objects. With my primary program accomplished, ZOMBIES!! By the time TSP ended, most of us were zombified from lack of sleep. One of the objects caught my attention, and I imaged a small galaxy using my conventional broadband filters in honor of Dr. Halton C. Arp, a 2005 TSP speaker, who passed away last December at the age of 87. The TSP Shade Tree Gang celebrated its 15th anniversary of camaraderie with a gala that featured the introduction of a new drink: the Shade Treerita. The usual week's worth of happy hours provided us with the opportunity to catch up with each other after a year's passage. As a member of the team, I participated in the SCURT raising. Placing it involved a climb atop Mt. Doom, a rise that dominates the eastern horizon at the Prude Ranch. I tried to collect data for the project. 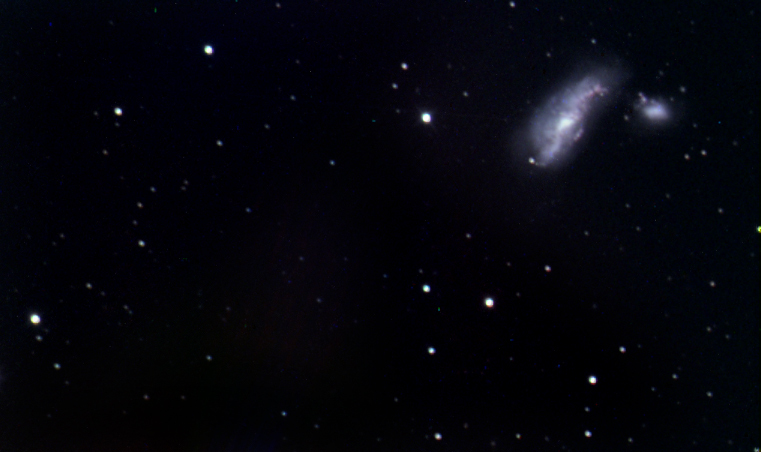 However, my telescope's prime focus imaging configuration did not yield usable data. Serving in the TSP Red Cap Corps, I also assisted other attendees with their gear. The staff of the Prude Guest Ranch did their usual excellent job of making sure we were comfortable and well fed. In gratitude for their hard work, I helped repair and keep some ranch equipment in working order so as to make their jobs easier. It was astonishing to have that many clear nights that close to the start of the “rainy” season in the Davis Mountains. There was precedent, however, as TSP 2008 was held close to the same time of the year and we enjoyed a similar number of clear nights. There are advantages to a late date: the Milky Way rises earlier in the evening and nighttime temperatures are more moderate. The detriments are that there are fewer hours of total darkness at night, and even less time for galaxy hunting. The latter one was made worse by my choice to set up my rig too close to the tree line. Despite that, I was ideally placed to take advantage of all the available time to image the nebulae. The saddest thing about the passage of time is the increasing absence of long time TSP attendees, and the rapid graying of many of my TSP friends. Yet, I am encouraged by the number of first time TSP attendees at this year's edition. I hope that for the sake of our noble pastime, that they will make it every year and that we can increase Astronomy's appeal to a new generation of imagers and observers. Emission Nebula (M8/NGC 6523) "The Lagoon" in Sagittarius. 5x200 secs. L, 5x300 secs. Ha, 5x600 secs. S-II, 5x450 secs. 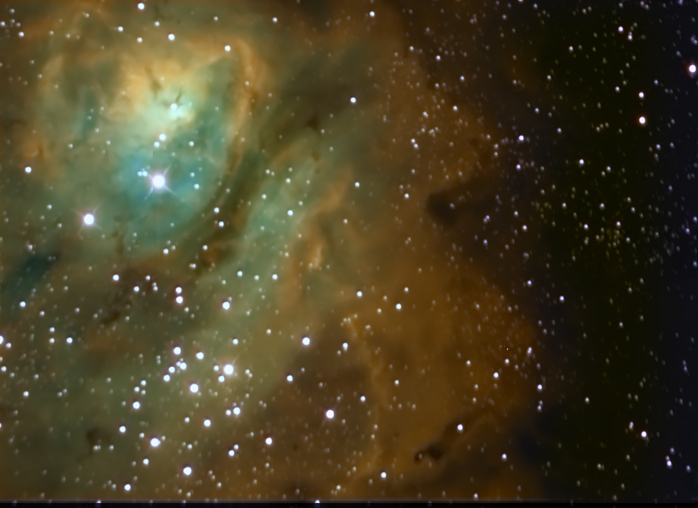 O-III, HST palette. 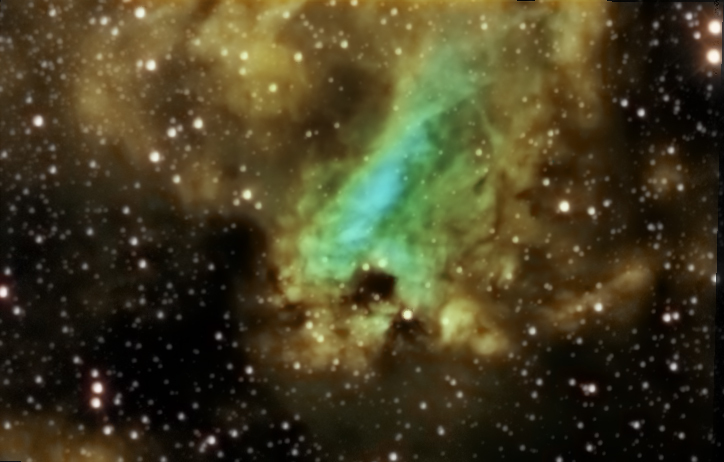 Emission Nebula (M17/NGC 6618) “The Swan” or “The Omega” in Sagittarius (or Serpens). 5X300 secs. L, 5x300 secs. Ha, 5x600 secs. S-II, 5x450 secs. O-III, HST palette. Peculiar Galaxy (Arp 269, NGC 4490/4485) “The Cocoon” in Canes Venatici. 4x600 secs. L, 3x300 secs. R, 3x450 secs. G, 3x600 secs. B. All astronomical images were acquired with an SBIG ST-8XME camera with AO-8, SBIG CFW-10 with Custom Scientific LRGB filters (for tricolor images), and Custom Scientific hydrogen alpha (H-a), Schuler sulfur II (S-II) and Baader oxygen III (O-III) filters (for narrowband images). Optics used was an Astro-Tech f/8 AT8RCF on a Losmandy Gemini I G-11 GEM. *These images are dedicated to the memory of my beloved father in law, Antoine Y. Yabroudi, who lost his long struggle with carcinoma on the morning of June 8, 2014. He was always fascinated with Astronomy and gave me unwavering support in my pursuit of the perfect images. Despite my repeated offers to cancel or cut short my TSP attendance, he insisted that I stick to my plan despite his worsening condition. I was fortunate to return home in time to be with him at the end. The TSP Shade Tree Gang. Happy hour at TSP 2014. The Lower Field at TSP 2014. The Middle Field at TSP 2014. Blackie on the Upper Field.